In my last article, I discussed the concept of a career path and how you can start building the best career path for you. I also gave a couple of examples of career paths. Here is a deeper dive into one of them, the project manager career path. If you’re wondering about the project manager career path, understanding the world of projects is the first step toward learning what a project manager does. A project is a collection of non-routine tasks, where the execution of this collection of tasks has a defined beginning and end, and where the collection is designed to accomplish a singular, primary goal. In project management, content knowledge, and management and leadership skills, are applied to achieve project goals. A project manager is accountable to achieve the goals of a project. Most importantly, project managers achieve project goals by managing and leading other people. These other people are members of the project team. Along your project manager career path, you’ll likely first work as a member of a project team. Project teams vary in size and composition. They can include everyone from a project’s executive sponsor, client representatives and other stakeholders who might not be involved in the day-to-day work of executing the project. But, it’s more likely that the project team will consist of the Project Manager and everyone she needs to get the day-to-day project work done. The Harvard Business Review has done an excellent job of describing critical project team roles. Although anyone can call themselves a project manager, part of the project manager career path is deciding if you’re going to become certified by the Project Management Institute as Project Management Professional (PMP). Some organizations prefer to hire PMP’s, while others don’t require any specific project management certification. Project management skills usually fall into these three, broad categories: content knowledge, management and leadership. Project managers also need an adequate understanding of project management itself. Let’s take a closer look. Let’s imagine a project to design a new mobile computing application. That application is going to help people find the freshest fruits and vegetables for sale in their city. In this example, the content of the project includes coding and digital graphic design. But it also includes knowledge of fruits and vegetables, knowledge of consumer behavior, and knowledge of the local city. This project’s manager should have one or more of these bodies of knowledge. Without any of these, a project manager would find managing this project difficult. Management is the efficient application of resources. That’s a pretty short definition, so you can check out the Business Dictionary for more detail. Leadership is the act of inspiring others to accomplish a goal in the manner desired by the leader. That’s the definition I learned in the military, and it served me well in my 25-year corporate career. But again, the Business Dictionary does a good job, too. Someone can understand the content of a project, and be a great manager and leader, but still be a bad project manager. Why? Because there are specific ways content knowledge, and management and leadership skills, are applied to achieve project goals. All of this is introduced in the Project Management Body of Knowledge (PMBOK, pronounced: pem-bok), published by the Project Management Institute. Even if you choose not to become certified as a PMP, this book is invaluable and widely available. Now that you know more about project management and project managers, let’s look at some popular project manager career paths. And, don’t forget what career path means: it’s the jobs we take on our way to reaching our career goal. Our goal here is to become a project manager. Prior to becoming engineering project managers, they likely worked at engineering firms as design engineers, technicians or technologists, or in other project roles. Managing a construction project is very different that managing an engineering project. While engineering can happen anywhere, construction happens exactly where something is being built. And, construction project managers have usually held construction jobs, such as laborers or trades people. If you’re already working in construction, then you’re in the right place to acquire the knowledge and experience to become a construction project manager. Luckily, that’s most places, but not everywhere, of course. 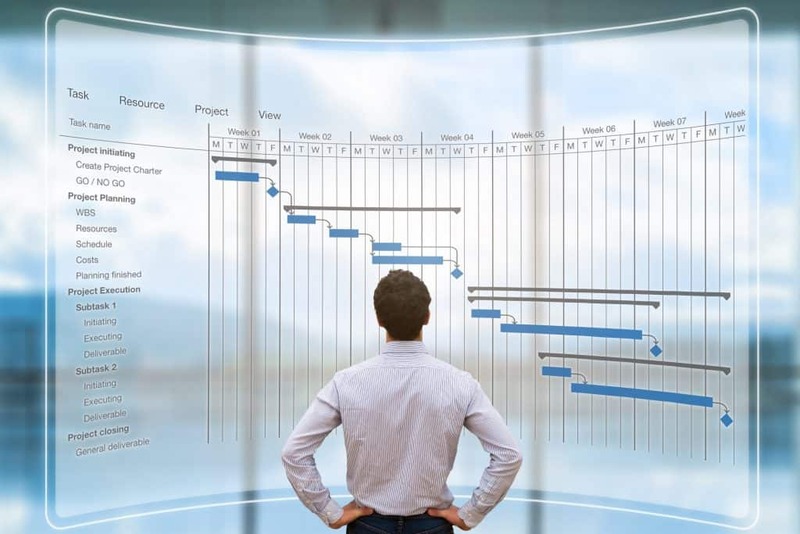 Being part of a project, or at least being able to observe the project happening, is valuable experience that might help you get a project management job. There are non-project management jobs in many organizations, including engineering, construction, and information technology companies. Working for a project manager is usually how people become project managers. Project management used to be a specialized skill only expected of senior professionals. But now, some project management knowledge and skill has become a job requirement for almost everyone. Many colleges and universities provide continuing education programs in project management. Completing one of these programs and adding it to your resume might be all it takes to start managing projects in your current organization, or get you an entry-level project management job somewhere else. How did you become a project manager? Are there better ways to become a project manager than what I’ve discussed in this article? Let me know on LinkedIn and Twitter. Don’t want to be a project manager? But maybe, after reading this article, you no longer want to be a project manager. If so, that’s great! An important part of finding the right job, is knowing what the wrong job might be. Our dissatisfaction with our current work is often what enables us to find the work that we were always meant to do. If you’re dissatisfied with your job, join our Work Feels Good community and learn how you can reclaim your world of work. You can also go to the Work Feels Good blog and subscribe for more articles like this one.